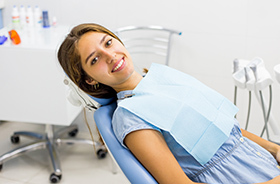 With the help of a modern intraoral camera, the Torrington Dental Care team can work together more effectively with patients in order to help them achieve their smile goals. Simply put, it helps you clearly see what’s going on inside your mouth! The images we capture will be transferred to a chairside monitor in the operatory, revealing any noticeable dental cracks, damaged fillings, decay, and more. Here in Torrington, we believe that well-informed patients make better decisions regarding their ongoing oral healthcare. That’s why our team will regularly use this handy visual aid when discussing treatment recommendations – we want you to fully understand the situation and why we believe a specific procedure is necessary. If you have any questions or concerns about this type of technology, don’t hesitate to contact us today.